The cover is finished! This took a little longer than expected but hey! I think it turned out alright in the end. 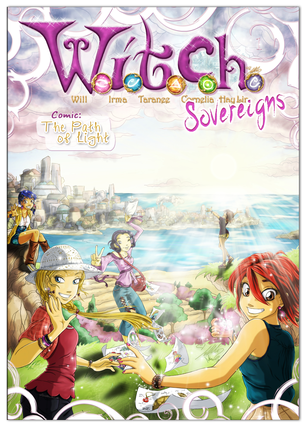 This means the first comic issue of "W.i.t.c.h. Sovereigns" has officially started!!! WOHOOO!!! The framing swirls was inspired by an Italian special which is equivalent to the "The Core of Kandrakar" story. That special was made in such a way, the title and some other details were... lofty. Meaning you could feel them with your fingers! I thought that was SO cool! And when I looked at this issue I thought there was something missing and so I decided on the swirls and on adding a little profile to them.